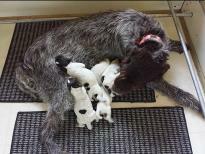 Pups are born just off the kitchen and are handled from day one. There are no “Do not Touch” signs around. They are very accustomed to pots and pans clanging, doors slamming and of course that dreded vaccumm cleaner. I start a very mild form of training on the 5th - 10th days of age. It’s called “stressing” them - It has worked well with all our past litters and it breaks down the pecking order in the litter - So everyone is assured a well balance pup - No alfa dogs in the litter and they are all ready to go to new homes at 7 weeks of age. 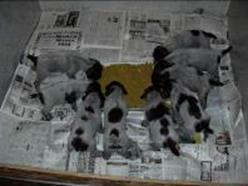 New owners claim that pups are very easy to house/crate break and take to basic and formal training very well. Dave and I have been training and raising hunting dogs since 1986. We started with the Brittany. We obtained our first Wirehaired Pointing Griffon “Upland’s Purdy Schatze” back in 1986 over 30 years ago and have done quite well with this wonderful breed and the litters we have produced. We have recieved numerous NAVHDA breeders awards to date starting back in 1996. Hopefully all of our new puppy buyers will understand the importance of testing their pups and exposing them to hunting elements before the test day. We take great pride in producing well socialized, stressed, natural versatile hunters and require new owners to test their pups in NA and hip x-rayed before any breeding restrictions are lifted. We do have a written contract and guarantee with our pups. We place our DE JACc’s pups in “Hunting Homes” only and are constantely striving to produce a better HUNTING GRIFFON with a dense harsh coat that doesn’t collect a lot of burrs when hunting. Can you tell ……..my job is brushing out the dogs while Dave is cleaning the birds?? I like a low maintence hunting dog.